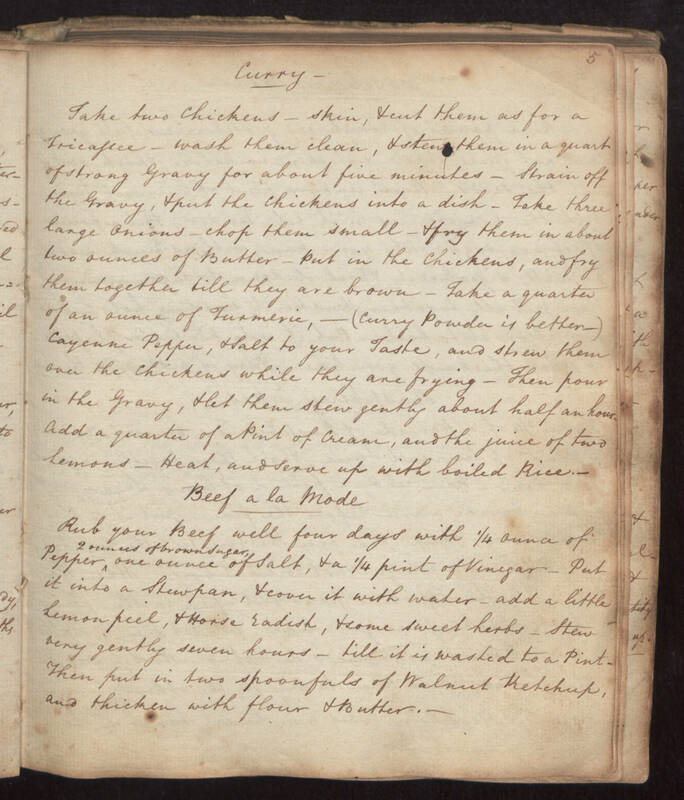 5 Curry Take two chickens, skin, & cut them as for a Fricassee, wash them clean, & stew them in a quart of strong Gravy for about five minutes. Strain off the Gravy, & put the chickens into a dish. Take three large Onions, chop them small, & fry them in about two ounces of Butter. Put in the chickens, and fry them together till they are brown. Take a quarter of an ounce of Turmeric, (curry Powder is better) Cayenne Pepper, & Salt to your Taste, and strew them over the chicken while they are frying. Then pour in the Gravy, & let them stew gently about half an hour. Add a quarter of a pint of Cream, and the juice of two lemons. Heat, and serve up with boiled Rice. Beef a la Mode Rub your Beef well four days with 1/4 ounce of Pepper, 2 ounces of brown Sugar, one ounce of Salt, & a 1/4 pint of Vinegar. Put it into a Stewpan, & cover it with water, add a little Lemon peel, & horse radish, & some sweet herbs. Stew very gently seven hours, till it is wasted to a Pint. Then put in two spoonfuls of Walnut Ketchup, and thicken with flour & Butter.